Suncast sheds are a premium choice in outdoor storage. Our Suncast resin sheds are built with heavy duty plastic material making them maintenance free! Suncast uses extra large panels to help you assemble your new building quickly and easily! Build up a high quality resin shed from Suncast today! When storage space is a problem, the Suncast Tremont is your answer. 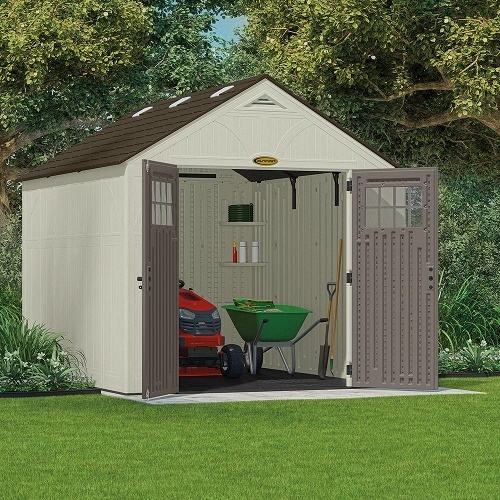 This Storage Shed has a large capacity 378 cu ft! The large double doors with windows gives you the the ability to move your large items in your shed. Suncast Sheds are constructed with blow molded resin that is durable and strong and also easy to clean, will not rust or rot. The roof is constructed with metal reinforced shingle style roof panels and 4 skylights that allow the natural light. There are also 2 corner shelves and a resin floor included!